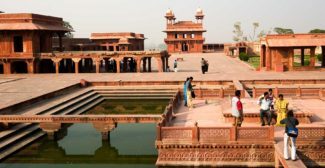 Fatehpur Sikri is about an hour’s drive from Agra and while it’s a harrowing bus ride – this is India afterall – it is well worth the trip. 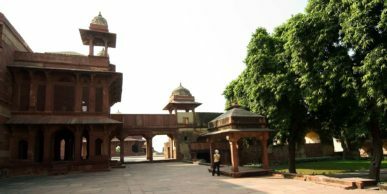 We arrived in Fatehpur Sikri in the afternoon and made our way straight to a hotel, with a roof top terrace so we could watch the world go by, and my was it entertaining! Sitting on the roof top we watched as the town went about it’s business in the street below. We watched as a fight broke out between two sari-clad women only ending when one took off her shoe and threw it at the other! We witnessed the festival of decorated horses and cattle and of course, as with all of India, the sacred cows wandering the streets at will. But as interesting as the street scene was, we were here to visit a mosque and the Royal Palace. 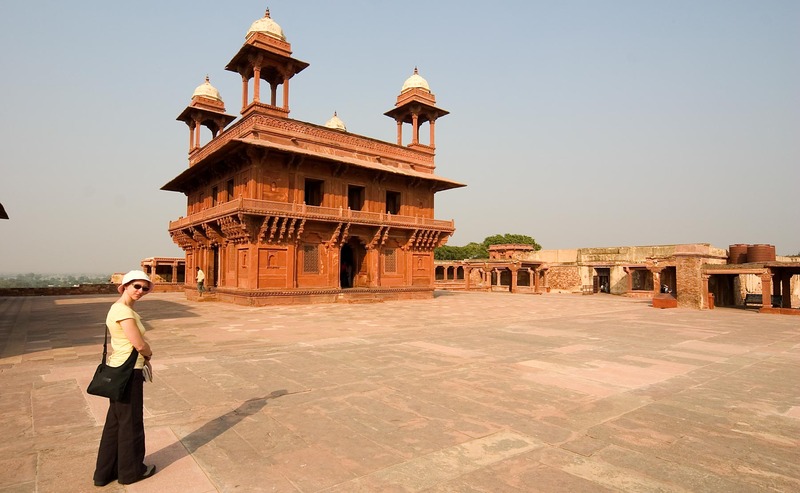 The Palace at Fatehpur Sikri was built by Mughal Emperor Akbar, who ruled from 1556 to 1605. 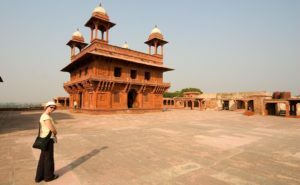 The Emperor was desperate to produce a male heir and in Sikri, he came across Shaykh Salim Chrishti, a Sufi mystic, who promised the ruler he would have at least three sons. A year later the first son arrived. In celebration, the Emperor moved his entire court to Sikri, which served as the Mughal centre for 15 years. Today the palace grounds, while somewhat desolate, are very impressive. Picture a huge red sandstone ghost town. The Jama Masjid, which sits just outside the palace grounds is an impressive mosque, however the constant approaches by touts make it an exhausting experience. While it is worth braving the onslaught, we were keen to get out of the mosque to get some peace as quickly as we could! It is far more relaxing inside the palace grounds, where tourists are left to wander in peace. We were pleasantly surprised to see that most of the tourists inside were Indian tourists. We had a lot of fun chatting to them and were constantly stopped and asked to pose for photos with them! We couldn’t help but oblige and of course asked them to return the favour! The palace overlooks the city centre and sits amongst beautiful, lush gardens. 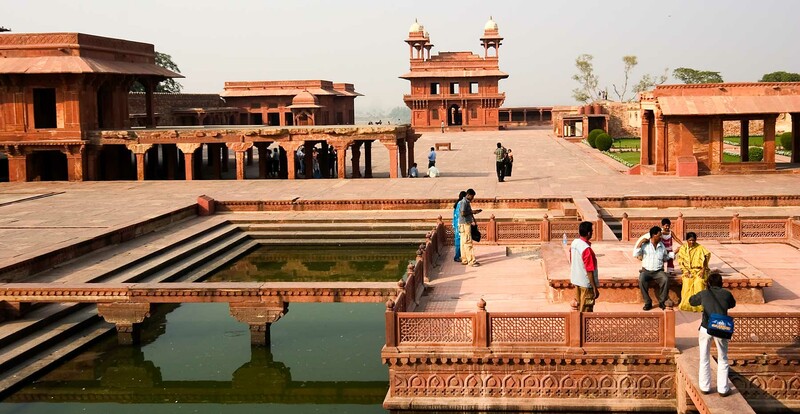 It is a tranquil place to just wander and imagine what life might have been like when the palace was full. 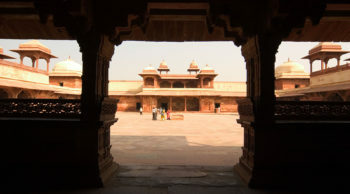 The sandstone buildings are intricately carved and have been well maintained. 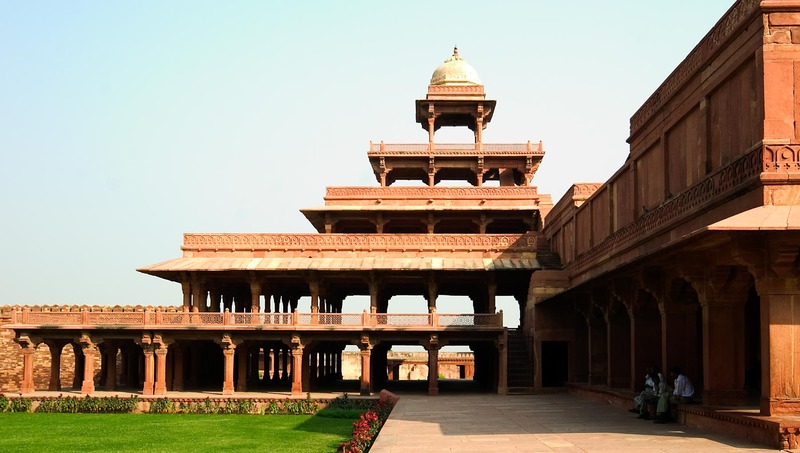 One of the more unusual – and interesting – buildings is the five-storey Panch Mahal, where Emperor Akbar sat on hot summer nights enjoying the breeze His harem would dance around on the levels below, no doubt creating an impressive swirl of colour!